So in Post 7a we created some tables with some specific data fields (varchar, char, etc…). Here will begin populating those tables. I haven’t had much time to write these queries, and this is only a portion of it. I figured I would put up a few more examples of making tables – rather than a real example per se, this is just going to be fairly large script that creates tables and then allows us to see what is going on in them. We can then run some SELECT statements against them and you can see how Primary Keys and Foreign Keys will work. So, let’s start shall we – this is only the first part of the script – the next part will be coming in the next day or so. That query just makes a few tables along with some primary keys and foreign key constraints. A foreign key more or less looks at a primary key in another table – and is bound to that if you will. Foreign keys can be null, but that sort of defeats the purpose of them. Coming up the next few posts we will look at all the things we can do with these constraints to make life a lot lot easier for you. Yes, it’s that easy. So, let’s make one for the next few examples we have. You’ll notice that I have the word “intermediate” in brackets – at times, you’ll run in to words in your database that are also database functions – one I get a lot in my job is “Status”. This is both a SQL function and the name of a column in a table. To discern one from the other, the function will never have brackets around it, and the column will. 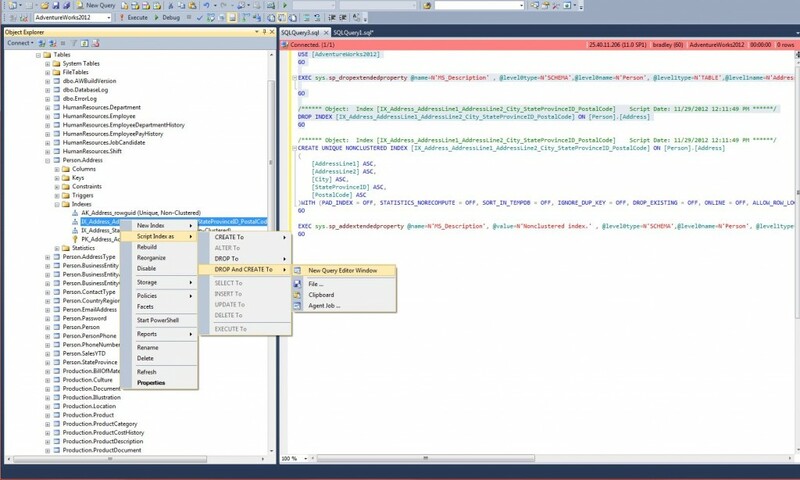 Generally if you are using SQL Server Management Studio (SSMS) and you see a word that you just wrote turn blue, you’re seeing SSMS tell you that it is a function. If you’re not sure, you can always use brackets, though I find that this makes writing queries much more difficult to write. In any event, now we have a database called “Intermediate”. Let’s use it, and create a table. You’ll see that some have a number behind the datatype and some do not – some datatypes require you to specify the field – such as “varchar” – you have to specify the max length of the field. With others, such as “int”, you do not. PRIMARY KEY means that this is a unique number – generally starting at 1 and moving upwards as it goes. NULL, and NOT NULL – these mean that the column can be NULL, or are not allowed to be NULL. If you choose not to write NULL or NOT NULL, it will default to NULL. I generally just get used to always writing NULL or NOT NULL so I do not forget if the time comes that I am designing a table. First off – I created a table called “Names” without specifying a schema (schema is the little bit before names – IE, HR.Employees – HR is the schema). If you do not specify a schema, it will default to “.dbo”. I’ll get in to schemas at a later post – for now .dbo will suffice. You’ll see I created a column called NameID – it’s an integer field that is a “Primary Key” – it’s also an Identity Column. This just means it will auto populate – we don’t need to insert an ID in to that. Each time you “INSERT” into that table, NameID will automatically be added, starting at 1 and going up from there. FirstName – I chose this is as varchar because it’s variable characters – You probably could make it text, but what if someone has a hyphenated first name such as “Lou-Anne” or “John-Jacob”. I also created it to be 32 characters long because honestly, who do you know that has a 32 character first name? LastName is very similar as it to the FirstName field we created. I personally have a hyphenated last name, so it needs to be varchar as well. Variable Characters. I chose for it to be 68 characters long because once again, who do you know who has a 68 character last name? Title should also be a varchar. There are titles out there of all sorts of people – Sales Representatives, CFOs, CEOs, Master Plumber, who knows what. [Address] – First off, we need to bracket that one because it is a server function. Secondly – I did it as nvarchar for no other reason other than to show you that there aren’t really much differences between varchar and nvarchar. City – This should also be varchar. It’s variable – Cities have all sorts of weird names. There may be a city like St. Mary’s Point. [State] – Once again this is a server function and should be bracketed. I made this 2 characters because rather than use the full state name, we are going to use the abbreviation. ZipCode – I made this as an int – I am only collecting the person’s 5 digit zip code, not the +4. Now that you know why I created it the way I did, let’s test some INSERTS and UPDATES. We’ll get a whopping 3 records back. Since we have an identity column, each row is unique based on it’s NameID. Because of that, we can use that in other tables rather than using things like, first name, etc… I’ll do more on this in the next post. That means we can updated based solely on the NameID. Identity columns are very very important in SQL – they make updating and interlinking tables extremely easy. Keep this table – we’ll be using it more in the next post. I apologize – I have been working on so many other projects that I have been neglecting SQL Server lately – but we will get back on it with this post. In the last post, I may have had you create a table. A table is a section of a database that contains data. Let’s first examine how a database in SQL Server is structured. First you have a database – think of that like a folder in a system file structure hierarchy. For example, C:\. After that you have tables – think of those as sub-folders of the main (root) folder. In Windows, that would be things like C:\Users. Each one of those folders contains certain data. You also have programmability – think of that as some of the programs in C:\Program Files. There are also functions – this would be like C:\Windows – things like regedit.exe, services.msc, gpedit.msc all would be considered functions. In any event, tables are the structure that contain the data. The structure of a table is very similar to what you would see in Excel – there are rows and columns. Each row contains a set of data pertaining to each column. Now – before we can create a table, we need to look at “data types”. Each column has to have a data type. There a host of different data types all of which are in their own area and have their own strengths and weaknesses and work better with certain types of data. It very largely depends on what you plan on putting in the column you want to create. I’m going to give an extremely brief synopsis of each data type, and then we will get creating some tables. 1. Exact numerics – these are numbers that are exact. When I say exact, it’s an integer. The number 1 is a numeric. The number 5410321 is an exact numeric. The number 2.123412 is an exact numeric. There are a certain set of data types that go with exact numerics and those are: INT, BIGINT, DECIMAL, BIT, MONEY, NUMERIC, SMALLINT, SMALLMONEY, TINYINT. Click on any one of them for more info. 2. Approximate numerics – these are numbers that are approximate. “Floating point data is approximate; therefore, not all values in the data type range can be represented exactly.” FLOAT and REAL are the two datatypes that part of approximate numerics. A lot of times I see money that is set as float. Usually a float is a decimal with no specific place where the . goes in the decimal. 3. Date and Time – this one is huge. I use this a LOT in my business because it is very handy and finding out when a row was last changed, modified, added, etc… There are several different types of Date and Time, all of which are awesome and very scalar and easy to modify – those are: DATE, DATETIME, DATETIME2, DATETIMEOFFSET, SMALLDATETIME, TIME. When in doubt, just use DATETIME or SMALLDATETIME. 4. Character and Unicode Character Strings – these are basically any type of character. Unicode is a type of character encoding. Character Strings are these: CHAR, VARCHAR, TEXT. Unicode Character strings are: NCHAR, NVARCHAR, NTEXT. So what is the difference between using VARCHAR and NVARCHAR? I’ll quote this from Stack Exchange: “An nvarchar column can store any Unicode data. A varchar column is restricted to an 8-bit codepage. Some people think that varchar should be used because it takes up less space. I believe this is not the correct answer. Codepage incompatabilities are a pain, and Unicode is the cure for codepage problems. With cheap disk and memory nowadays, there is really no reason to waste time mucking around with code pages anymore. All modern operating systems and development platforms use Unicode internally. By using nvarchar rather than varchar, you can avoid doing encoding conversions every time you read from or write to the database. Conversions take time, and are prone to errors. And recovery from conversion errors is a non-trivial problem. I tend to stick with varchar in most cases personally, but that is up to you. 4. Binary strings – these are strings of 0 and 1. Only that. I like using them for true and false statements and as a flag. They are BINARY, VARBINARY, and IMAGE. Every row in that table will be turned to ‘1’. If the column you are updating is an identity column, you will get an error back. An identity column is one that contains a unique identifier for that row, or in other words, a unique piece of data (usually a number). If you attempt to change that, you’ll get an error back because SQL will not want to change that to a potentially non-unique ID. Cannot update identity column 'empid'. So we added the lastname, plus a comma and a space, plus the first name in to that column. Yay. Not too hard right? You can do some massive UPDATE statements as well using a combination of SELECTS and values.